DragonRidge Country Club is a premier championship golf course steeped in traditional Scottish heritage and fixed within the grandeur of MacDonald Highlands. Here, you will discover an unforgettably satisfying 18-hole championship golf course that begins at the base of rugged highlands and rolls deep within the McCullough Mountain Range. From the moment you take to the first tee, you will see unmistakable historic hallmarks designed by course architects Jay Morrish and David Druzisky. Their magnificent par 72 course spans wondrous carries, rolling fairways, and breaking greens. 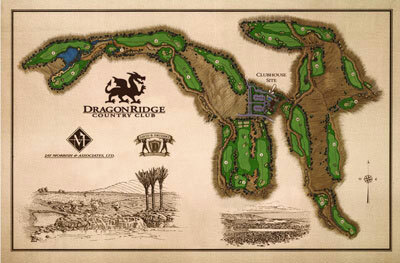 With a variety of shot options and choices of play, DragonRidge challenges casual and skilled golfers alike. There is something else. DragonRidge blends several triumphant innovations with the rich tradition of a sport born along Links of the East of Scotland. The most striking is the golf membership program that affords more than mere privileges. It grants unlimited access to affluent amenities such as the golf shop, swimming pool, fitness center, and dining room. Enjoyed only by an exclusive few, golf membership offers an unparalleled level of distinction among golfers in Southern Nevada. How do we know? Just as their kinsmen did 500 years ago, the Scots make better clubs. And this club is mightier. Like most great golf courses the opening hole at DragonRidge Country Club offers an oppartunity to get off to a good start. This 411-yard par 4 does play into a prevailing wind, but it's generous landing area and large putting surface makes the hole manageable. Pro tip: Favor the left side of this wide and generous fairway. This will give a clear and elevated view of the green. This 229-yard, par 3 offers one of the most picturesque views of the Las Vegas valley. With the Dragon tees situated nearly 125 feet above the green, this intimidating hole plays much easier than its appearence suggests. Pro tip: The hillside tees may make the hole play one or two clubs shorter, but be sure to factor the wind. This relatively short par 4 plays to 398-yards. A birdie hole for some, but a desert wash borders the entire left side of the fairway and graduates in front, to the right and around the backside of the green...beware. Pro tip: The ideal tee shot is to favor the right side of the fairway that slopes from right to left. The first of our par 5's, this 523-yard hole is reachable in two. A collection of bunkers guards this undulating green that is among the toughest on the course. Pro tip: This par 5 is reachable in two shots if your tee shot is hit long enough down the left side of the fairway. Another great par 3, this 185-yard hole requires a forced carry over desert with a water feature protecting the left side and front of the green. With no bail out left or right, your only relief is long. Another dramatic elevation change completes the overall challenge this hole poses. Pro tip: This two level green plays one club longer if the pin is in the back. Hit enough club to carry the water! This beautiful 359-yard par 4 is framed by a hillside left that embraces magnificent homes and a fairway bunker right that runs nearly the entire length of the hole. The elevated tee makes this hole appear more difficult than it actually is. Pro tip: Favor the right side of the fairway to provide an open view of the green. The fairway is generous and the bunker is deceptively short of the green. Amoung the most difficult holes at DragonRidge, the signature par 4 seventh plays at 441-yards and is very intimidating. A well placed tee shot to a landing area that gradually narrows is a must. The second is uphill to a shallow green protected by a bunker front and a creek behind that collects to the breathtaking water hazard that protects the right side of this hole. Pro tip: The risky lake edge drive is rewarded with a better angle to the green. Safety is found playing the hole along the left. This seemingly tame par 5 is seldom reachable in two. At 563-yards, its undulating fairways make for a difficult second, and usually positioning is the key. The third is relatively simple, but is deceiving, placing the premium on club selection. Pro tip: A true three shot hole for most. A tee shot down the right side will compensate for the right to left slope of the fairway and the green is best approached from the left. Completing the more traditional design of our outward nine holes, this is arguably the most difficult. At 444-yards this par 4 doglegs right, but slopes severely left. A good tee shot will still require a mid to long iron uphill to a well guarded and difficult putting surface. Pro tip: The tee shot should favor the right side to compensate for the right to left sloping fariway. Avoid the bunkers throughout this long up-hill hole. Controversial...Yes...Difficult...Maybe. This downhill 386-yard par 4 reveals two alternatives from the teeing area. Play left to a narrow, but visible landing area, and it's only a short iron in. Play right and you're somewhat in the dark, hitting to a blind but generous fairway. Reach it safely and there's next to nothing left. Pro tip: A mid or long iron down the left is the smart play. A risky drive over the right is rewarded with an easy approach shot. Framed by fairway and greenside bunkes, the eleventh is another great par 4 playing at 440-yards. A good tee shot here is vital, but you can bring sand into play. The second shot demands an accurate mid iron to an elevated green perched on a hillside. Pro tip: Play your tee shot just right of the left fairway bunkers to allow the best approach to the favorable left side of the green. A true 3 shot hole, this 562-yard uphill par 5 offers little advantage for those long or brave enough to go for it in two. A forced lay-up on the second shot is perhaps the most difficult element bringing trouble into play if the shot is not perfectly positioned. You are then left with an uphill shot to a large green where only the flagstick can be seen. Pro tip: The fairway ends abruptly and is reachable for the longest hitters. Shot selection is key to the second shot of this three shot par 5. An intimidating hole from the start, this short but dangerous par 4 leaves little room for error. At 375-yards the elevated tee reveals a generous landing area, but with trouble both left and right it often proves elusive. The second shot reveals even less, requiring pinpoint accuracy from an uneven fariway to small two tiered green surrounded by death. Pro tip: This fairway is wide, but favor the left side for the best approach to this very small green. A premium is put on the second shot club selection. Another great example of the dramatic elevation changes which make up DragonRidge. At 202-yards this par 3 demands a forced carry from one hillside to another. With the green precariously situated on a shelf, anything but a good shot simply won't do. Pro tip: An extra club may be required to reach this uphill par 3. Aim left over the bunker to take advantage of the severe left-to-right hillside slope to the green. Like hole #1, this 418-yard par 4 plays into a prevailing wind. Although the yardage is comparable, it is not really as forgiving and with trouble from tee to green, an accurate tee shot is essential. The second will require a longer iron to an unusual green positioned only a few feet away from the desert to the left. You can bail out right, but with little hope of getting up and down. Pro tip: While avoiding the wash, a tee shot down the left leaves the best approach to the green, which slopes from right-to-left. From the right side of the fairway an approach shot over the bunker should release to the center of the green. Most great courses offer a reachable par 4 and DragonRidge is no exception. A beautiful hole, this 320-yard dogleg left meanders through the beginning of a small canyon. A long tee shot over a hillside will yield favorable results, while an errant one could prove distastous. Of course an iron off the tee might make better sense, but an accurate second shot to a green sloping from front to back is essential. Pro tip: This short dogleg left requires a tee shot to carry the left bunker allowing a short iron to a green that slopes from front-to-back. Another picturesque hole with dramatic views, this 194-yqrd beauty completes our collection of solid par 3's. The elevated tee reveals a forced carry to a large green with dramatic bunkering to the right and backsides. Pro tip: Intentionally deceptive, this par 3 has one of the largest greens with more unseen grass on the left of the green. At 607-yards this par 5 home hole offers little opportunity with a forced carry of nearly 230 yards. Conventional wisdom dictated that even better players are faced with a more realistic but formidable challenge from the Colbalt tee box. At 553-yards there are alternate landing areas that are dissected by a desert wash that runs the full length of the hole and fronts the kidney shaped green. This hole is reachable in two, but the tee shot is the key. Pro tip: The right fairway is the safest play for this par 5. The second shot should be played just over the fairway bunker to allow an easy short shot to this shallow green. A full service 60,000 square foot practice area awaits both Members and guests alike. The practice area features a driving range, short game area with sand bunkers and two bent grass putting greens. The practice area with unlimited golf balls is included with each paid green fee, and is available at anytime prior to your round. An attendant will be standing on the practice facility not only to clean your clubs, offer advise, but coordinate with the starter when play will begin on the first tee. A staff of Golf Professional's are avaliable to provide lessons and sharpen your skills. Perhaps you see your Ceremony taking place with the spectacular back drop of the Las Vegas Strip, r set in the midst of our pristine golf course with lush green fairways, glistening lakes, waterfalls and towering palm trees. Or, you may choose to delight your guests with an evening ceremony and a poolside reception by cascading waterfall... Maybe your special day will take place amid the opulence of elegant rooms bedecked with magnificent stonework towering ceilings, and original Asian tapestries. At DragonRidge Country Club you can be sure to find an elegant indoor or outdoor setting that will enchant your guests and fulfill your dreams.